Ajax captain Siem de Jong made a big move abroad signing a 6-year contract at Newcastle United from Ajax in summer 2014. His transfer fee was almost 9 M€. His brother Luuk then also played at the Magpies (on loan from Monchengladbach), but left the club for PSV before Siem came over. 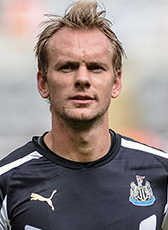 Siem de Jong did not play that many games with a total of 22 for Newcastle United because of injuries. In August 2016 Siem was finally reunited with his younger brother Luuk when he went on a season-long loan deal to PSV. In August 2017 it was announced that De Jong finally returned home. His former club Ajax has signed the midfielder on a 3-year contract. Because of minimal chances De Jong agreed a loan deal at Sydney FC for the 2018-19 season. His second move abroad.